← Do I have to change my personality to market my book? How many of us have wanted to leave the ‘rat race’ (who does ‘race’ rats?) and open a cafe or tea shop? Especially one set in a village close to wonderful rolling countryside and just a few miles from the sea?I have just come back from a weekend catching up with friends from our years spent in Brighton & Hove. It is a part of the country we still love, although as soon as we left we knew the cost of moving back would be prohibitive. Classic commuter country villages with the benefits of the city scene in Brighton make it very different from the Somerset we live in now. So we make the most of our invitations back and try to meet up with as many people as possible. So on Saturday we popped in on our old mate Chris Wilson, who I have previously remembered best as the guy who, fifteen years ago, encouraged me to drink three cocktails involving about 10 different spirits. The results were of course predictable, but less predictable at the time would have been the sight of him behind the counter of his very own cafe, making me a cup of fresh ground (and very strong) coffee. Chris has done what many of us dream of. 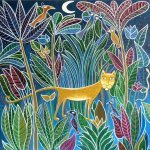 Already living with lovely Karen and the kids in the West Sussex village of Hassocks, he left his job in a local authority and invested his money in his own ethical, local cafe and meeting space. Blessing it with the wonderful name ‘The Purple Carrot’ he opened in May (before it was, strictly speaking, ready for the big launch) and set about his task of challenging the mass-market global coffee chains. If anyone can do it, Chris can. Anyone who has played golf with him is well aware of his determined, competitive streak. Actually, I have been there when it has been referred to as something quite different…. 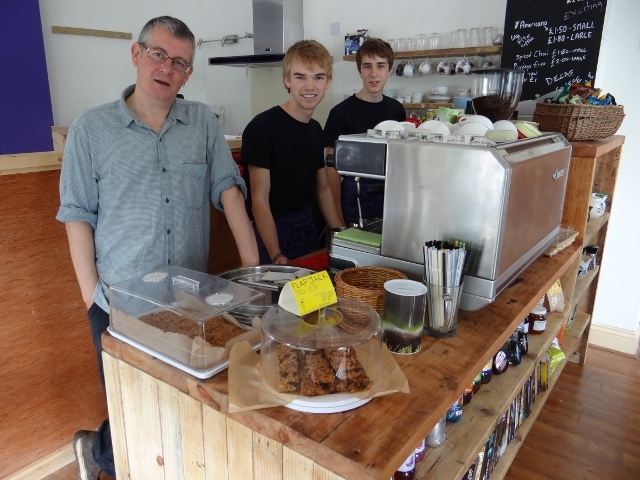 The Purple Carrot will provide tea, coffee, cakes – local and ethically sourced food and snacks, as well as smoothies and shakes. Chris also hopes to offer light evening meals as soon as the kitchen is completed. He has had to endure endless negotiations with the local council and that hit me as something not many of us consider when imagining the dream – the beaurocracy has been a nightmare, even for someone who spent 19 years working for a local council. Frustratingly, the previous owners of the premises he has taken over ran some sort of beauty-come-massage parlour that was never once inspected by any of the officers who have pored over every word in Chris’s applications. He wanted to be honest and up-front and it has cost him dearly. Remember that – those of you out there thinking that no-one will worry about that oven you want to bake your scones in…..
Chris is doing the things we would all like to expect from new cafes. He is keen to promote local food suppliers and wants to work according to ethical standards. This isn’t easy of course and it is much more expensive. Of course even the sunny south coast cannot yet manage to grow coffee beans successfully (especially in the recent weather…) so some smooth, strong beans from ethical traders have been sourced; but cakes will be home-made out of good things. He also wants to encourage book and other community groups to use the space and has already had a number of enquiries about regular bookings. It is a great opportunity if the local population will embrace it. Anyway, this isn’t just an ad for Chris, although it wouldn’t matter if it was, so supportive am I of the ideas behind what he is doing. 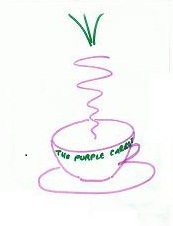 As we sat in the cafe on Saturday, discussing how The Purple Carrot, with free wi-fi (really free – not like Costa where it gives you half an hour if you are lucky) could become a haunt for impoverished writers, I started to think more about how we all, in our different ways, look to ‘live the dream’. I was desperate to write and when redundancy left me at home with no excuses and a mortgage to pay I took my chance. I am never going to have ‘enough’ money (whatever that may mean now) but seeing articles in magazines and books like Dandelions and Bad Hair Days coming to fruition none of that seems to matter. Instead of writing formulaic strategy documents no-one ever read properly, I am ‘creating’ something that has a tangible, original existence outside of myself and I am more my own person than I have ever been. Who was it said ‘no-one lies on their death-bed saying “I wish I had spent more time in the office” ‘? So that is what I think ‘living the dream’ is all about. Not money, fame or a five-star review by Jay Rayner. Not the Kindle Top 100 or Sunday Times bestseller lists (though that would be nice..) The Dragon’s Den may, if given the opportunity, have chewed Chris’s business plan to pieces but I have confidence he will make a go of it and I wish him all the best. And it was a great cup of coffee….. This entry was posted in Dandelions and Bad Hair Days, Random musings on family life, love the universe and everything, Work and tagged business, cafe, dreams, family, Food, The Purple Carrot, writing. Bookmark the permalink.